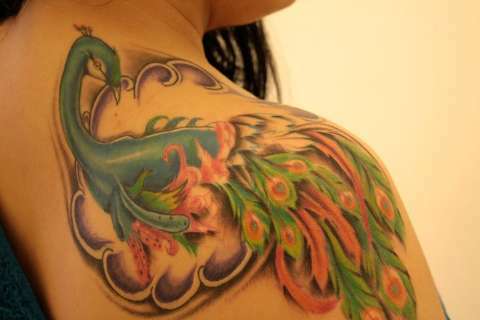 Peacock tat now has feathers colored in!! So now the feathers on my peacock are colored in!! Next session on tuesday August 17 the purple shading will get fixed and the top part of the tail will be colored!!! Cant wait to get this done!! Turning up to b better than i hoped!!!! Wow, I'm loving this, it is really taking shape, looks fantastic 8)...can't wait to see when it is done!!! Thanks for sharing the update with me! I look forward to seeing this finished! Post a pic when it's healed.. It's beautiful sweetie... looking forward to seeing it completed!